You have probably figured out that I’m a serious Anglophile! But I don’t feel quite so out of place with the rest of the world obsessed with all things English at the moment. Combined with the anniversary of the London Olympic openings, I thought it quite the thing to share these hilarious videos. The Brits really outdid themselves! Here’s Mr. Bean and the Chariots of Fire theme. Been in a storm lately? Our “young ladies” Sunday school class uses LifeWay’s “MasterWork” series, using books by Christian writers and condensing them down to 4-8 week studies. This week we are starting Max Lucado’s Fearless. WOW! If the first week is any indication, it’s going to be great. Fear, it seems, has taken a 100-year lease on the building next door and set up shop. Oversized and rude, fear is unwilling to share the heart with happiness. Happiness complies and leaves. Do you ever see the two together? Can one be happy and afraid at the same time? Clear thinking and afraid? Confident and afraid? Merciful and afraid? No. Fear is the big bully in the high school hallway: brash, loud, and umproductive. For all the noise fear makes and room it takes, fear does little good. Fear herds us into a prison and slams the doors. Have you been in that prison? Are you there now? The text for the week is the storm on the Sea of Galilee in Matthew 8. 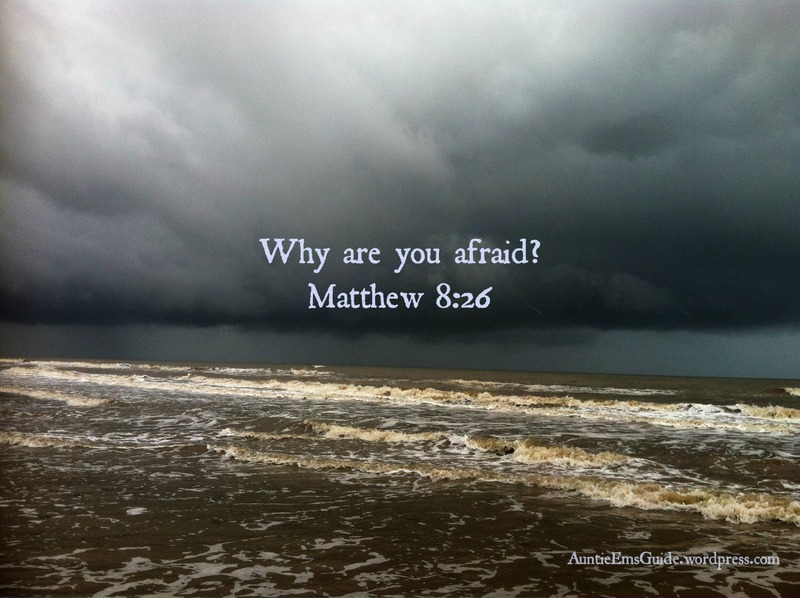 “Why are you afraid? You have so little faith!” [Are you kidding me? Why are we afraid?] Then he got up and rebuked the wind and waves, and suddenly there was a great calm. After all the miracles they had seen; after all the love Jesus had demonstrated, in Mark’s account (4:35-41) their first question was “Don’t you care that we are going to drown?” Fear gives us amnesia sometimes. It corrodes our confidence in God’s goodness. [Lucado] And then we begin grabbing at any straw we can in order to feel that we are in control of something– our kids, our schedule, the clutter in our homes. Christ gives 21 “don’t fear”-type commands. (There are only 8 of the second most common command, to love God and your neighbors.) I think this is an indication of how prevalent God knew that our fear would be, and how much help He knew we would need! In the first week’s wrap-up, Max reminds us that fear will run amok in our worlds, but we don’t have to let it fill our hearts. It will knock on our doors, but we don’t have to ask it in for dinner or to stay the night! Here are some ways to fight fear when it comes knocking. 1. Stay close to Christ by spending time in prayer and in the Word regularly. 1 John 4:18 There is no fear in love, but perfect love casts out fear..
How have you fought fear? I love zucchini, and it’s supposedly one of the most prolific producers in home gardens.. Of the 3 years I’ve planted it, that’s been true only 1 year. I harvested exactly *two* small ones this year before the vine borers got my plants. I’ve planted more since then but they aren’t yet mature enough to produce. 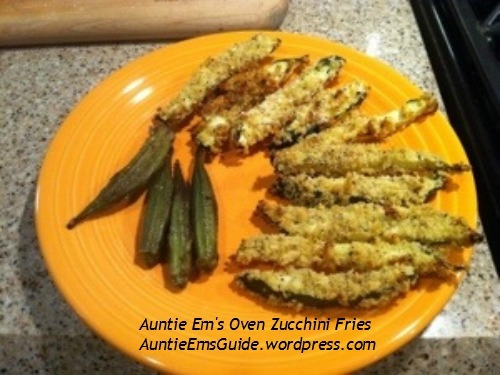 I tried these “fries” and they were a big hit! I repined it from my “food” board to my “I DID IT!” board. 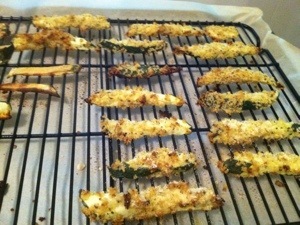 Start by slicing the zucchini in strips about 1/2 x 1/2 and 4 inches long. The recipe called for dipping in an egg wash but I used buttermilk. (like I do for my fried chicken) I like lots of pepper too! Here is where you season them, though you can add seasons in your bread crumbs too. Then dip in some kind of breading. 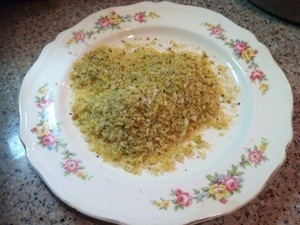 I used Italian style Panko. I got some rice-flour “Gourmet Fish Fry” that I want to try, too. Cornmeal would also be good. 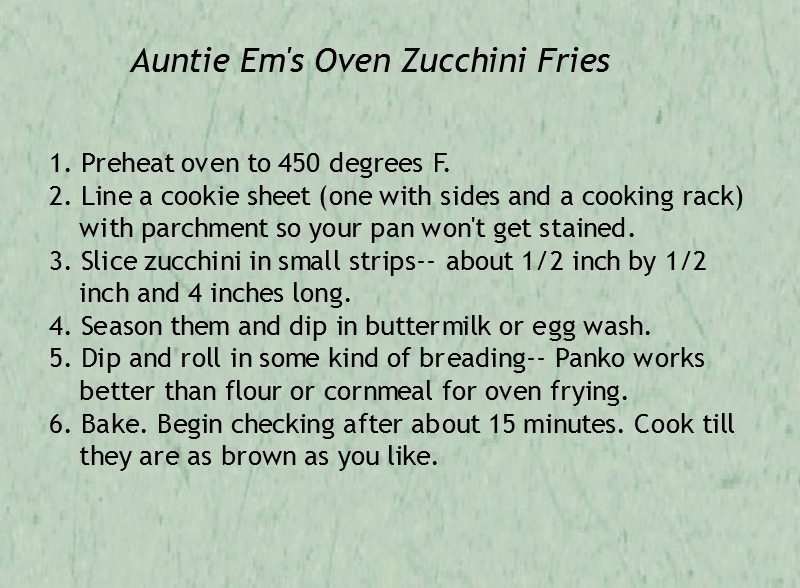 Line a pan with parchment paper, then lay the strips on a wire rack and bake at 450 for about 15 minutes. 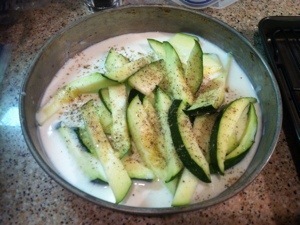 Lots of variables can change the cooking time– the thickness of the zucchini, how much water it has– so check often. Cook it to the degree of brownness you like. Delish! A marriage where both spouses are fully committed to the Lord will be beautiful showcases of the fruits of the Spirit! 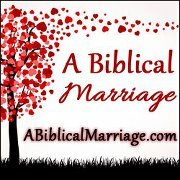 Last month at A Biblical Marriage, I began a series applying the fruits of the Spirit to our marriages, starting with LOVE. Join me this month as we explore JOY. (Click the picture below.) While not quite as exciting as happiness, joy is the one I’d choose if I could take only one. Come on over and join us! Then answer the question: When have your circumstances made for unhappiness, but you’ve still had joy? A merry heart is good medicine. 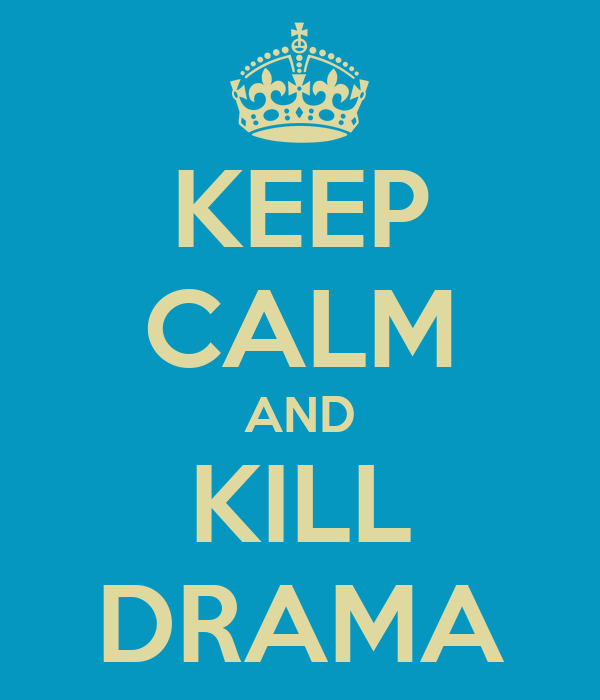 *If you are not familiar with American usage, “being a ham” is slang for overacting BADLY! *DISCLAIMER* If you suffer from sinus and allergy problems, this post is for you. It’s kind of gross. If you are one of the lucky ones who don’t have this problem, you might want to skip this one. Auntie Em has been fighting a sinus infection for over a month now. That’s part of the reason you haven’t seen much new content here on the blog. In addition to antibiotics, decongestant, Prednisone, cough medicine, Mucinex, and enough water to float a battleship, I’ve found something that has helped a lot: a saline nasal rinse. I was introduced to it when I had sinus surgery 6 years ago, and honestly, I probably wouldn’t have tried it had I not been instructed to by my doctor. It took some getting used to, but now that I can do it without choking, I heartily recommend it! You can use a Neti pot and buy ready made packets or make your own and use a bulb syringe. I use a cup of warm water, 1/4 to 1/2 tsp salt, and 1/8-1/4 tsp baking soda. Stir till dissolved. Start with a weaker solution; too much salt can burn. The first time I did it I made the stronger solution, and when it (inevitably) got down my throat I thought I had gargled with acid or something and I was hoarse for a while! Put your hair back. It’s a little messy. Get tissues and/or hand towels ready for when you’re finished. Making a “k” sound closes everything, and you should do this when you start to avoid the water running down your throat. It won’t hurt anything but you might cough and sputter! You can close off just your sinuses by making a “ng” sound. If you can do this while breathing through your mouth, you can hold the solution in your sinuses longer, which is a good thing. TO USE– you want the solution to go all into your sinuses, even up behind your eyes. You’ll need to get upside down. My ears are very stopped up too, and leaning my head forward, like over the bathtub, hurts, so I lean my head back as far as I can instead. I hold on to the door frame to help keep my balance. Lean your head back or over. Fill the syringe and gently place it far up into your nostril. Closing off your sinuses, gently squeeze out the solution. You will be able to feel it inside your head; it’s weird. Hold for 15-30 seconds, or as long as you can. Then lean over the sink or tub and let it drain out. Finish off by “running” the solution through your sinuses. Lean over sideways; put the syringe into your top nostril and squeeze the solution through. It will drain out the other side. Then switch sides. Blow, wipe, and clean up. A bit of water might continue to drip out for a while, so keep a tissue handy. You will be surprised what is hiding in your head even after you think you are clear of infection. Hope this helps! Substitute Blogger for Auntie Em! Good morning Internet! This is Auntie Em’s youngest daughter, Sunshine, reporting live from Texas. I don’t know Mom’s usual posting schedule but in case she misses a regular, I didn’t want anyone to worry! Mr. X is going to be JUST FINE, but he was in a motorcycle accident yesterday morning and is in the hospital now. Mom is there with him and Sis and I visited last night. So please, if you’re the praying kind, pray for my dad’s recovery and strength and stamina for my mom as she will be taking care of him! Sunday Social at the Sasse Life! 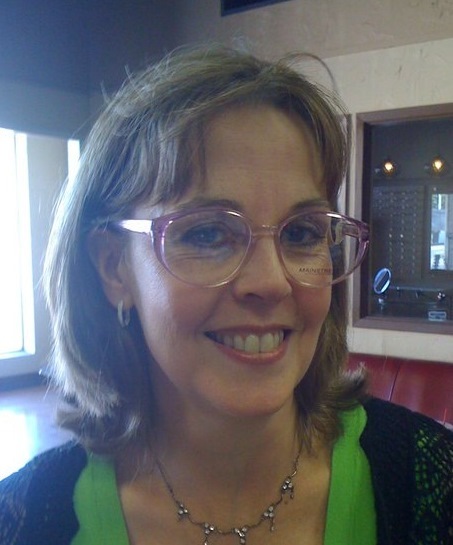 Sweet Kim at The Sasse Life is featuring Auntie Em this week at the Sunday Social! Please hop on over and visit her blog, and some of the other party-goers! And link up your own blog while you’re there! 1. 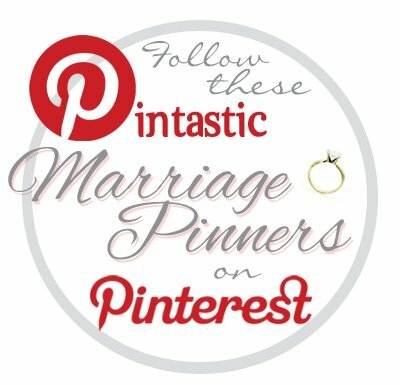 Please follow the Featured blogger. 2. Link up your blog’s homepage. 3. Check out some other awesome blogs that linked up. 4. Have fun & get social! The featured blog this week Auntie Em’s Guide to Life. Auntie Em is the bloggy alter-ego of Melinda Stanton, who is a wife to one, mom to 3, mom-in-law to 2, and choir teacher to hundreds over the past 20 years. New to and very excited about the blogging world, she feels like the old chaperone of the bunch, but she’s just glad the “young-uns” invited her to the dance! With a 30+ year marriage, a paid-off house, no debt, and independent adult children who really like their family, Auntie Em has learned some things along the way and is glad to help others learn from her experience. 1.I had a 9-lb baby with no anesthesia. In four hours. This still just blows my mind. Three children– 12 hours of labor, total. I was made for childbirth. And I really would rather have a baby than get a filling. 3.My favorite color is blue. I like blue walls, carpet, ceilings, flowers, dishes, clothes, sapphires, aquamarines… I have a “blue” Pinterest board that makes me so happy! 4.I love all lots of different kinds of music. When I used to order CDs from a club, I would get classical piano, choral, 70s soft rock, bluegrass, Motown… all in one order. During one short period ; ;I was playing fiddle in bluegrass jams, piano at my church, and singing (German) Beethoven’s Ninth Symphony with our Symphony Chorus! 5. ;I love to grow flowers and I love to save money, so I have been known to pinch off stems from unsuspecting plants in public places. It used to embarrass my daughters, but now they do it too! Don’t forget to stop by Melinda’s blog. Who influences you? Who is your role model? Whose style do you study and copy? I have always been very intrigued by the British Royal Family. I was born just a few months before Princess Diana, and she was one of my stars for a long time. I wore ruffles and opaque tights like she did. I coveted a sapphire and diamond ring; never got one, but I did get a really nice knock-off! I was very sad about all her personal problems, marriage breakup, and untimely death. Now I’ve shifted my style love to her daughter-in-law, the Duchess of Cambridge. If only I were 9 inches taller I might could pull off some of her looks! However, what I love about her besides her great fashion sense and beauty is her modesty, confidence, kindness, and sense of duty. She seems very comfortable in her skin, and those are great qualities to emulate. In real life, my colleague at work, who is 16 years younger than I, is my role model. My guiding principle has always been comfort, and if I liked an article of clothing in 1986, then I probably still do! In our first year of teaching together, she hid my bathing suit (that I was so proud of, being able to fit in it 15 years after I bought it), then took me on a “What not to wear” shopping expedition! I also consult my daughters- I don’t want to be one of those women who, at 50, is trying to look 25, but a little fashion sense never hurt anyone! 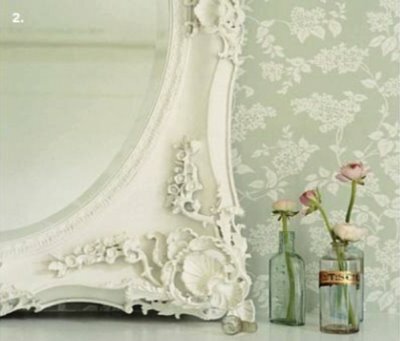 The designer and decorator Laura Ashley managed to capture my decorating tastes completely. I bought several of her books to give me starting places. I love Shabby Chic and have recently discovered Pottery Barn. For things spiritual: of course the authors of the Bible, but some others have influenced me too. C.S. Lewis has written some of the best, most thought-provoking literature I’ve ever read. His children’s series (The Chronicles of Narnia– if you haven’t read them, go get them TODAY!) are perfectly entertaining as stand-alone stories, but so much deeper when you look at them through the lens of his Christianity. His Screwtape Letters and Mere Christianity are 2 of my all-time favorites. He has influenced me time and again. Andy Stanley, the senior pastor of Northpoint Community Church in Alpharetta, Georgia speaks the Truth so eloquently and creatively; every time I listen to him it’s like a V-8 moment! For mothering: My sister. She is 5 years older than I am, and I got to spend lots of time with her and her young kids before I ever married, so I had a lot of experience going into motherhood. For music: my piano teacher, Jay. I took lessons from him from 8th grade through college, and a bit again after all the children were here and I needed to work my brain. Then he taught both my girls, so we have maintained a close relationship. If I can’t remember the name of a piece of music, I call him and hum it; he will be able to tell me what it is! For mental and emotional health. TeeKay of AThimblesWorthofWisdom.wordpress.com . She left her position as choir teacher to study counseling. I got her job, and the benefit of her new career! She has been a friend and mentor for 30 years now. 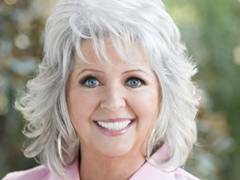 For cooking: My mother-in-law and Paula Deen… Use more butter! For wisdom in decision making: Mr X. He is very level-headed, and can see all sides of a situation easily. He can anticipate problems so that we can work them out in advance, which is very hard for me. I always think everything will work out just fine! For how to be kind and giving, and to “bloom where I’m planted”: my mother. My goodness, she was the sweetest person you could meet. She took care of people – that was how she related to everyone. She was a 2nd grade teacher, and everyone I ever knew that had her or worked with her praised her kindness. After her stroke, when she lived alone in an apartment complex, she was the young one of the circle of little old ladies living there. She organized domino games, took them out to eat, drove them to the grocery store or ran errands for them. . When she moved into a nursing home the last 3 years of her life, she had the same sweet spirit among the residents– she was a party waiting to happen! So dears, think about it. In what areas of you life do you need encouragement or improvement? Choose a board of directors for yourself!